Liquid or Granular Weed Killers? Q. I've been doing my best to follow the recommendations you make in the lawn care guide I downloaded from your website this past spring. 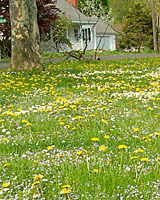 From the guide, I've learned that the best time to control dandelions and other weeds is in the fall. One question you don't seem to address in the guide, however, is whether liquid or granular weed killers are more effective? Your guidance on this matter will be helpful. A. I'm glad you've found my "Central New York Lawn Care" and "Recommended Lawn Care Product" guides to be helpful. And, I want to commend you for your patience in dealing with the broadleaf weeds in your lawn. I promise that your patience will be rewarded when you see fewer weeds next spring! For controlling existing broadleaf lawn weeds in the fall, I recommend using liquid herbicide formulations versus granular formulations. It's much easier, for example, to "spot treat" isolated infestations of weeds in a lawn, such as this patch of bird's foot trefoil, at left, with a liquid herbicide. Because you can apply the product only on the weeds, not on the lawn between the weeds you'll almost always use less herbicide to control the same number of weeds. Liquid herbicides also cover leaf surfaces more uniformly. This often means that the weeds will be absorbed more herbicide, leading to more thorough control. And, the herbicide active ingredient that's most effective against groundivy and wild violets, triclopyr (3,5,6-trichloro-2-pyridinyloxyacetic acid), is only available in liquid formulations, such as Ortho's "Weed B Gon Max, at right, and Ortho's "Weed B Gon Chickweed, Clover & Oxalis Killer," below left. Of course, while liquid weed killers offer several advantages, they also have a couple of limitations. First, it's very important that you apply them when the wind is calm. You certainly don't want the herbicide drifting across your lawn onto your favorite trees, shrubs or perennials - or onto your neighbor's property! Fortunately, applying liquid herbicides in the fall reduces this risk as many non-target plants are dropping their leaves. Also, don't mix more herbicide than what you're going to need to do the job. If you have some left over when you're finished, offer it to your neighbors so they can treat their weeds, or carefully empty the herbicide into a labeled container that can be sealed tightly and stored safely until you can dispose of it properly at the next hazardous waste collection day in your community. Finally, when using any type of pesticide under any condition, there's no substitute for the label. Please read it thoroughly and follow its instructions to the letter at all times. And, remember that unless you change the conditions in your lawn that allowed weeds to thrive in the first place (too wet, too dry, too much shade, mowing too low, etc. ), no amount of herbicide will result in a weed-free lawn.